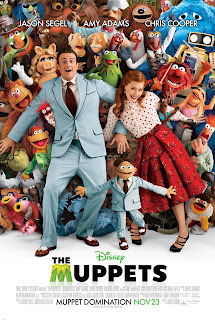 Avowed Muppet superfan Jason Segel takes the reigns of the beloved Jim Henson characters in The Muppets, an ingratiating film that nonetheless struggles to surmount the high expectations cultivated by a rapturous promotional campaign and its own interjections of self-importance. Co-writer and producer Segel stars as Gary, a full-grown man who happens to be the brother of Walter, a creature who is Muppet in appearance but human in acculturation. 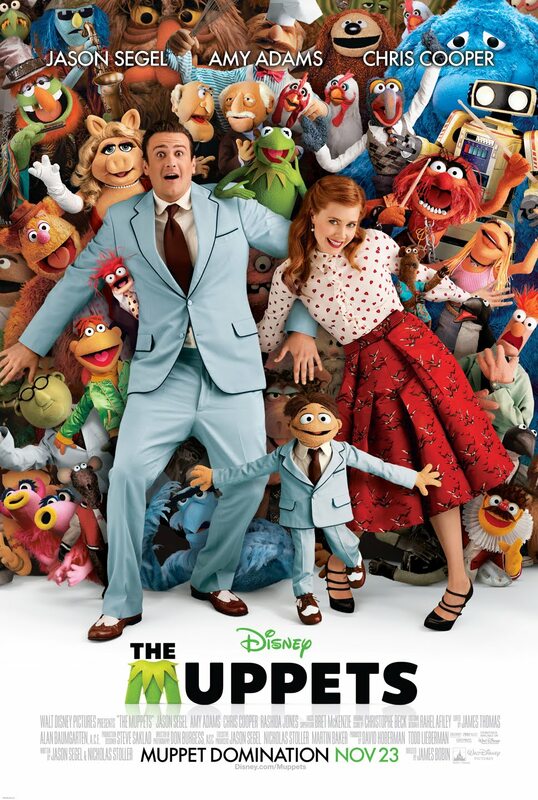 After a lifetime spent idolizing Kermit and the gang, the siblings embark on a Muppet-centric tour of Los Angeles with Segel's under-appreciated sweetheart (Amy Adams) when they learn that greedy oil executive Chris Cooper plans to demolish the troupe's old studio and theater. Segel and Walter then scramble to reunite the Muppets, all long removed from their glory days, in a last-ditch attempt to save their legacy. One thing that the movie largely manages to avoid is any mention, directly or indirectly, of Henson's legacy. The getting-the-band-back-together structure of the movie's first half never succeeds in showing what makes these characters worth summoning again, and often uses tone-deaf and strangely violent methods to extract the Muppets from their post-showbiz occupations (Fozzie Bear's fate as a seedy casino performer is particularly off-key). The integration of Walter into the cast is also an stumbling block. While he performs his intended function as a symbol for maturation and finding one's place in the world, he also represents Segel's Muppetized ego. Walter is often thrust into the curious role of Muppet savior that, however inadvertently, seems to suggest that Segel has filled the same role in the real world. The good news is that there are still plenty of reasons to be proud of The Muppets. The movie really hits its stride when the Muppets stage a telethon to raise the money that will fend off Cooper's hostile takeover, a brilliantly-staged homage to the Muppet Show of the late 1970s that harks back to that program's wholesome brand of comedic mayhem. The movie is also successful in blending old Muppet standbys - celebrity cameos, misdirection gags - with some fresh and surprising elements. Of the latter, the original songs by Flight of the Conchords troubadour Bret McKenzie stand out, reaching an apex with the trans-species ballad "Man or Muppet?" Such self-deprecating humor has always been the foundation of the Muppets' appeal, and the filmmakers realize this in the nick of time. After enduring plenty of over-enthusiastic posturing early on, I was beyond delighted when The Muppets was willing to settle for putting a smile on my face.